He is learning to swim, WOW im so proud of him he is an expert at it... of course with floaties!!! but he even lays on his back LOL and goes from end to end at the pool :) by 3 he might even be swimming on his own. 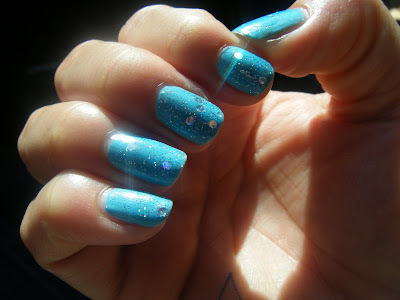 So looking at the blue water in pool made me want a aqua mani.. tried to make as simple as possible... So i just did 2 layers of Love & Beauty Aqua & one layer of NYX Glitter Under the Moon... 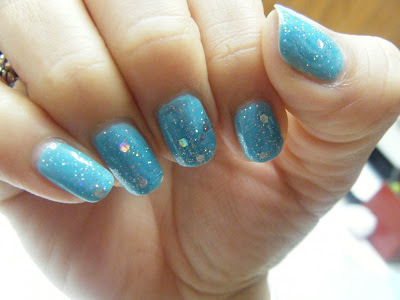 I LOVE THEIR GLITTER.. here it is.. its very simple but glitter makes EVERYTHING look sooooo PRETTY!!!! Very pretty! I love the glitter! i love the color. nice one. Nice mani. I haven't tried glitter yet. Congrats on your 19 followers!